The mission of this page is to employ PowerShell’s Compare-Object to find differences in registry settings, in other words, to discover where changes to settings are stored in the registry. You should be comfortable using regedit. In particular to be happy exporting 'All' the registry, or better still, just a branch of the registry. Take the time to understand how PowerShell’s Get-Content and Compare-Object work together, trace how they open the two .reg files then display differences. Tune-In to the arrow logic. Specifically, to workout whether => refers to an entry in the first file, or the second one. a) At least one setting in the registry has changed. b) You have a name for the value. 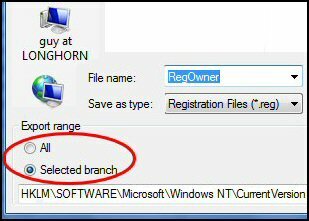 However, to complete your real-life mission you need to employ regedit’s ‘Find’ to locate the name of the full path to the registry setting that changed. Let us start by cheating. Cheating in the sense that before we start we already know the answer to the question: 'Where does the setting reside in the registry?' The value that I selected for our experiment is RegisteredOwner. The crucial decision will always be to export 'All', or just 'Selected branch'. All is safer and will collect every bit of data, Selected branch will speed up the search operation, it's your decision. Give the file a meaningful name, and make a note of the path as you will need it in the PowerShell script. Key point: Change the value for RegisteredOwner. Repeat the Export, but naturally, give second file a different name. Result: you have two files, one before the change, and one after. Note 2: If you don’t like the logic, then you could swap $Pre and $After. => Means the InputObject is present in the difference (second) file, but not in the first file. In this scenario it means the value "Second Owner". <= Present in reference (first) file, but not in the second file. In my example this is the value before we made a change. This script is a useful reminder to see Compare-Object’s parameters. Note 3: With Compare-Object, there are two required parameters -referenceObject and -differenceObject. For most examples -referenceObject controls the master content, the file which holds ALL the information, while -differenceObject has the secondary or ‘after the event’ file. Also note what help says about these parameters; in particular that the position of these parameters is important, reference list first, difference list second. Note 4: Should you see == it means present in both files. If you add the -IncludeEqual parameter, then you will see this double= =equals underneath ‘SideIndicator’ in the output. However, you may have to wait ages for the script to complete. If you have a scenario where you want to find registry settings, then master Compare-Object and its complimentary cmdlet Get-Content. Take the time to break-down your project into stages.